What happens when you tuck Hanweir, the Writhing Township? Coordinated Assault , Enrage , Otherworldly Outburst is cool and you can loop it if the creature you buff dies making a token, Samut's Sprint , Titan's Strength , Accelerate , Aleatory , Chaotic Strike , Stun , Niveous Wisps , Carom , Formation gives banding which is spicy, Spiritualize , Stave Off , Bathe in Light , Feat of Resistance , Chaos Warp target tokens to get permanets from your deck for free, and is good removal. these are some cards I think you should look at, don't need all and some might not fit exactly but if you like them then put them in. Cut some lands you can go down to 34 if you add in more artifacts, which go great with paradox engine. Cards I think you should replace: Emerge Unscathed rebound fucks with your commander it exiles them not letting you put them back into your hand; Aurelia's Fury really expensive to get any good use out of it, or if you want protection during your turns run Grand Abolisher or Silence ; Expose Evil is too slow of a draw engine Mentor of the Meek with the tokens you make is better for drawing; Burnished Hart and Solemn Simulacrum are meh, better to go with artifact ramp that can feed the paradox plan, plus artifact ramp is cheaper and faster; speaking of artifacts Boros Cluestone and Boros Keyrune are good flavor options but aren't that good as other artifacts; Inferno Titan and Sun Titan are good creatures but don't fit into the game plan as well better to put things that help with the gameplan. No targeted removal package? 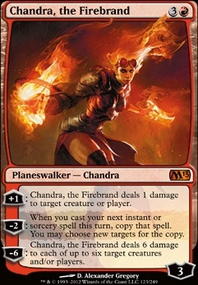 I would think Path to Exile and Chaos Warp would be good ones to target your own creatures with n a pinch, especially with Young Pyromancer to give you targets. 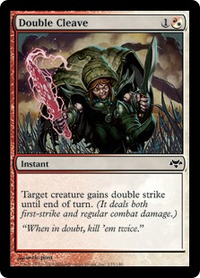 Swords to Plowshares is not as good of a spell to hit your own guys with. but it is decent removal. I'd add Chaos Warp , Bedevil , and Impending Disaster . 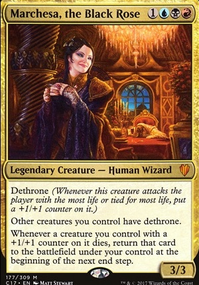 Azeworai I do have Dwarven Recruiter in the sideboard, I need to playtest the deck before I decide if I need him. I did completely forget about Chaos Warp though. Thanks for the suggestions. Boros isn't really my wheelhouse, but I wanted to build a vehicle deck for S's & G's. Hey, you could upgrade the mana rocks that you're already playing? All except Sol Ring and Monolith of course. All the rocks I suggested ETB untapped. Dragon's Hoard for instance for the same mana cost has much more repeatable value than Vessel of Endless Rest . Hoard is both a mana rock and a draw engine. Mind Stone also has more value then Fire Diamond because Stone ETB untapped and can be sac to draw later on when you don't need ramp. The mana rocks you play don't have to make red mana, it would nice if they did, but they don't have to because there's 31 Mountains here. Red mana is not a problem; the rocks just need to be able to make mana, colorless mana, for ramp to get Zirilan or another Dragon onto the battlefield faster. 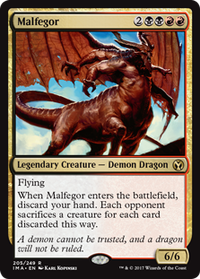 There's a lot of high CMC Dragons here; if Zirilan gets stuck in the Command Zone due to Commander cost or disrupted and you're unable to use his ability to cheat Dragons onto the battlefield then you want a backup plan to be able to cast Dragons. Mana rocks for ramp is a good backup plan. 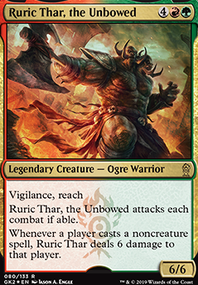 Semi-budget rocks such as Thran Dynamo and Gilded Lotus are good when playing lots of high CMC cards. Cards like Mishra's Bauble and Urza's Bauble are fine, but I think they would be better as mana rocks. Blood Frenzy and Volcanic Offering are okay, but they're a one time shot spell and as a one time use they lose a lot of playability. One time effects from cards like Chaos Warp and Gamble are worth it because these effects for the mana cost are unique in red/powerful for red. Fling is fine if you have ways to repeatably cast it, but as a one time effect with only one Dragon it's very lackluster. Consider Goblin Welder ? Welder, Feldon of the Third Path and Steel Hellkite have great interaction because Hellkite is an artifact Dragon. 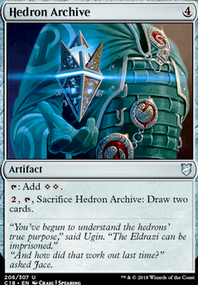 The tokens that Feldon creates are artifacts you can use one of these artifact creature tokens at instant speed with Welder to sac it to reanimate Hellkite or any other artifact. Welder can also be a way to reanimate an artifact sac/tuck outlet which you need on the battlefield otherwise the Dragon you cheat into play with Zirilan will be exiled end of your turn. Welder also helps to assemble the Monolith + Rings artifact combo. Solemn Simulacrum is very good with Welder and Feldon because he's an artifact who gives you value when he ETB and when he dies. Cards like Welder and Feldon can benefit from cards that can put other cards into your graveyard. Consider adding Daretti, Scrap Savant , Faithless Looting and Gamble? Daretti is repeatable draw/graveyard enabler/reanimate artifact. Consider Tel-Jilad Stylus ? The most mana cost effective way to tuck a Dragon back into your library. Artifacts are honestly just as important for your deck's strategy then Dragons are.